Tendonitis refers to the swelling and irritation of the tendons surrounding the knee. 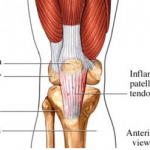 Patellar tendonitis is the most common knee tendonitis. Fast growing adolescents and older populations are at an increased risk of this condition. As the human body ages, tendons, muscles and ligaments lose their elasticity and are more susceptible to developing irritation and inflammation. Knee tendonitis produces pain, tenderness and stiffness around the joint. Certain movements may aggravate the joint, at times causing severe, sharp pain. Treatment for knee tendonitis generally follows a conservative approach. Rest, ice, compression and elevation (R.I.C.E.) is recommended to decrease inflammation. If conservative measures fail after several weeks, consult your physician for a comprehensive examination of the joint. In extreme cases, the tendon may need surgical repair.